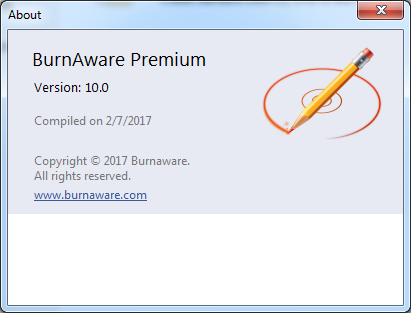 BurnAware 10 is a family of full-featured and free burning software to create CD, DVD and Blu-ray discs of all types. Home users can easily burn bootable discs, multisession discs, high-quality audio CDs and video DVDs, make, copy and burn disc images. Power users will benefit from BurnAware's advanced options, including control of boot settings, UDF partition and versions, ISO levels and restrictions, session selection, CD text for tracks and discs, data recovering, disc spanning and direct copying. Support of high-DPI monitors and settings. Support of all screen readers. Command-line support for Copy to Image tool. %DISC_NUMBER% suffix parameter to set disc number in title. Updated installer, EULA and translations. Program uses system font and theme as default. Fixed minor bug with update notifications. Fixed bug with saving file with settings. Resolved problem with hanging during file preparing.